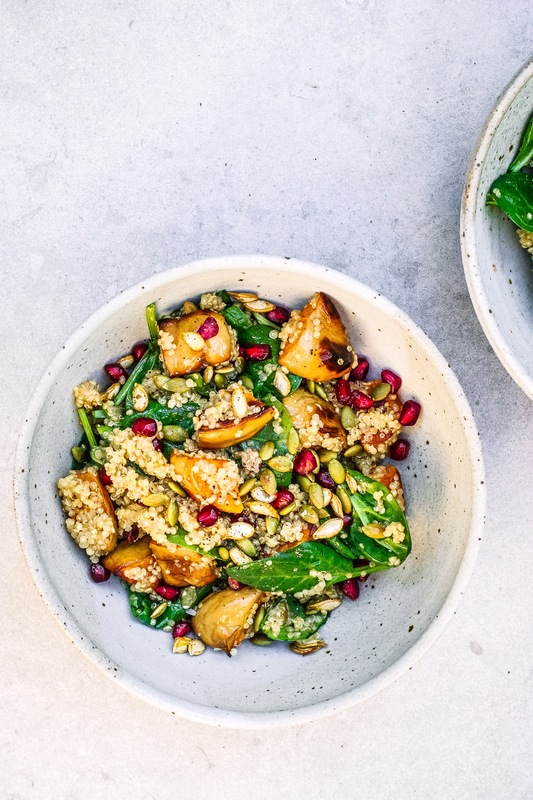 This Pumpkin & Pomegranate Quinoa Salad is such a gorgeous autumn salad that makes lovely leftovers. If you already have some cooked quinoa this is the perfect way to use it. I use both the seeds from inside the pumpkin and the green ones from the shop. Chop the pumpkin into cubes, add them to a roasting tray and drizzle with olive oil and a good pinch of sea salt and pepper. Roast at 200’C for about 30 minutes until tender and starting to crisp. If using the seeds from the pumpkin, toss them in olive oil and salt and add them for the last 10 minutes. Add the quinoa and stock to a saucepan on medium heat and pop the lid on. Let it bubble away until all of the liquid has been absorbed (about 12-15 minutes), then set it aside for about 5 minutes with the lid still on. Then remove the lid and leave it to cool. When the pumpkin is ready add it to a large bowl with the quinoa and set it aside to cool. If using store bought pumpkin seeds, toast them in a pan on medium heat until crunchy. Whisk together all of the ingredients for the dressing. 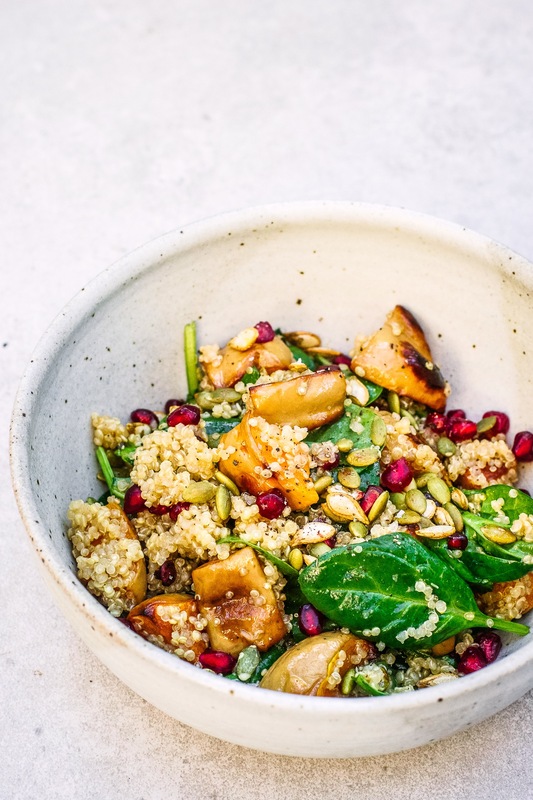 When the pumpkin and quinoa are cool add the pomegranate and spinach to the bowl. Drizzle over the dressing and toss well. Serve with the toasted pumpkin seeds on top.